March 2013 commemorates the 150th anniversary of the death of explorer and naturalist William John Burchell. He left a treasure trove of natural history specimens, many of which are now in the Museum. 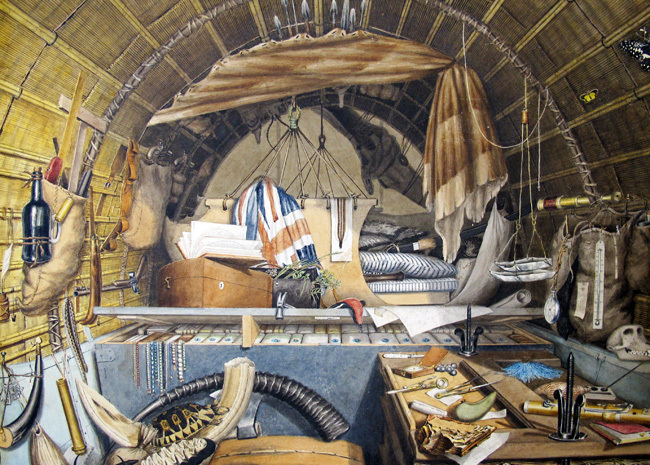 This painting by William Burchell depicts his collecting wagon. Burchell noted that the sketching took him four days and the painting 27, in total 120 hours. He says he started on 12 February 1820 drawing the tortoise, elephant tooth and hippopotamus tusk, and two days later drew the press screws, memorandum book, flute and shell. The painting was exhibited at the Royal Academy later that year. William Burchell learned about plants in his family’s London nursery business, and by working at Kew Gardens. Seeking new opportunities, he travelled to the Atlantic island of St Helena in 1805, becoming a school master and the island’s botanist. Five years later, he set off for Cape Town, to embark on a series of explorations through Cape Province to the desolate Karoo plains. He travelled 4,500 miles, drawing accurate maps and collecting as many different plants, animals, rocks and minerals as he could. In total, he described and collected over 63,000 specimens, most of which he gave to the British Museum. Some of the specimens to be seen in Burchell’s painting are in the Museum’s collections. They include a tortoise which he collected on 10 October 1814; the tusk of a hippopotamus, and the molar tooth of an elephant. The picture also shows some of the butterflies and moths in Burchell’s collection. Although the University of Oxford awarded him an honorary degree in 1834, his work was not widely recognised. Disillusioned and unhappy, he committed suicide in 1863. Two years later, his sister donated his remaining plants to Kew Gardens, and all his other specimens to the Oxford University Museum of Natural History. They include many ‘type specimens’ of species that were new to science.